Q: What makes you want to be a teacher? A: I want to be a teacher because I think education is the most valuable component of our society. Though I am a self-identified nerd who loves learning, I believe the true value of gaining knowledge is the enhanced ability to share and apply that knowledge to help people. I hope to instill that same philosophy in my students to support their development as global citizens engaged with their own communities. As a teacher, I’m excited to have a direct impact on youth during their most formative years as well as for the unique opportunity to inspire lifelong commitments and shape worldviews. I want to invest in the success of our future by helping to create a generation of young people who have the confidence in themselves to question their surroundings, to think critically, develop their own opinions, utilize resources at their disposal to achieve their goals, and contribute to society to their full potential. Q: Why did you choose Northwestern University’s MSEd Program? A: In order to be effective, a teacher must understand the challenges faced by students and the lens through which information is being processed. Therefore, I appreciate the MSEd program’s focus on preparing educators to serve the specific needs of different populations in varying social contexts. I felt that Northwestern University’s expert faculty, emphasis on pairing theoretical practices with hands on experience, collaborative supervision, and support of students would give me the tools to succeed in serving diverse populations and to create a socially and academically inclusive classroom. Not only is its focus on the relationship between education and social policy perfectly aligned with my own interests, but I also felt the MSEd program would give me the skills to make meaningful impacts in those areas. Q: What were you doing prior to starting at Northwestern? 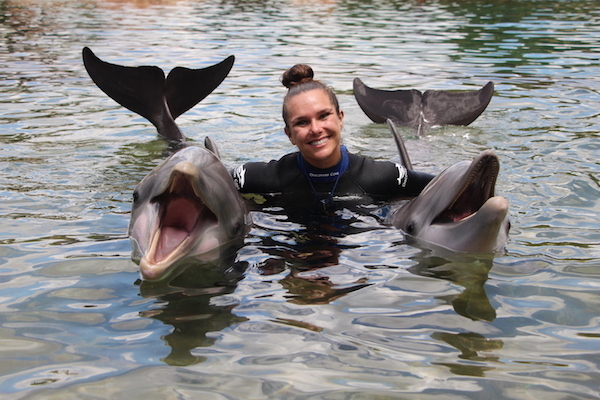 A: Immediately before starting the MSEd program, I was applying my passions for learning and teaching as a dolphin trainer at SeaWorld’s Discovery Cove. Many people find this transition odd, but to me they’re actually remarkably similar careers. I’ll simply be teaching a different kind of mammal with whom I can communicate more verbally. I’m excited to apply the principles I learned from working with dolphins about behavioral modification, and the importance of consistency, clarity, and patience to teaching children. One of the largest similarities and most important lessons I took away from my training experience is the understanding that participation is completely voluntary. A dolphin has to choose to participate in any given session, so it was my job as a trainer to make each of those learning opportunities as fun and engaging as possible. To me, traditional education requires an analogous approach: students may be forced to sit in a classroom, but they have to choose to learn. I strive to be the kind of teacher that inspires students to be excited about learning. I am passionate about the work I did at Discovery Cove to raise awareness of environmental issues and inspire involvement in conservation efforts, and I’m looking forward to now facilitating students’ discoveries of their own passions. Q: What advice or insight would you give to an incoming first year in the Northwestern MSEd Program? A: It sounds clicheé, but I think the biggest realization I’ve made as I venture into adulthood is that it’s all going to be okay. That was especially true as I began this program. Any new environment is nerve wracking, but when you can share that collective experience with your peers and have the support of MSEd administrators, you’re already set up for success. I was overwhelmed and terrified to start this program, but I asked questions, even if I felt foolish for doing so, and listened to what my peers and professors had to say. I embraced the community and allowed it to embrace me back and quickly found my place within it. Q: What is the sense of community like in the MSEd program at Northwestern? A: The sense of community within the MSEd program is stronger than I ever would have anticipated. I moved from Florida a week before the start of the program having never even been to Illinois and without knowing anyone in the area. Even so, Evanston already feels like home. The program staff and administrators are not only knowledgeable, but dedicated and compassionate as well. From my first inquiries during the application process to encouraging me through state exams and the beginning of practicum process, the MSEd department has been a vital resource and support system. That sense of community only becomes stronger within the program itself. My cohort consists of inspiring, supportive, like-minded yet diverse peers to collaborate with and learn from. I consider myself lucky to call them my friends, but don’t think that compatibility is a coincidence and mostly am grateful to the MSEd program for the introduction. Q: What are you most excited about for student teaching? The most nervous about? A: I am most excited to apply all of the concepts and strategies we’ve talked about in the MSEd classroom to my own classroom and to learn in a hands-on way in collaboration with an education expert. Student teaching is a unique opportunity to have someone who knows you, your students, the content area, and the nuance of teaching consistently observe you to set you up for success for the rest of your career. As far as apprehension, I’m most nervous that I’m going to be too hard on myself or too ambitious in my goals for my classroom. I’m learning so many great theories and approaches in my MSEd classes, but it’s unrealistic for me to expect I will be able to implement all of them as such a new teacher so I hope my mentor teachers can help me find that balance. I’d also be lying if I said I wasn't’t nervous about being mistaken for a student! Q: Tell us a little bit about your Master’s Project. What are you planning to research and/or what are you interested to learn more about and explore? A: For my Master’s project I hope to explore the role social bias plays in a classroom. I’m curious both about instruction in terms of how to effectively address social issues and make students aware of biases, but also the role those biases play within the classroom. I am interested in researching how curriculum and instruction can acknowledge social issues and bias or how classrooms can minimize or even counter the effects of social bias.